Donald Trump has recently made big news with his pardon of controversial Sheriff Joe Arpaio. It may take some time until that particular case is adjudicated completely. In the meantime, we want you to understand what a pardon is. The Florida Constitution of 1968 grants the Governor the power to give people clemency. This means that the Governor is responsible for deciding who receives a pardon. The Governor, along with members of the cabinet, form the Clemency Board. There are certain limitations to a pardon. When someone has been convicted of treason, or when an impeachment results in a conviction, a pardon cannot be granted. The Clemency Board is not allowed to revoke nor grant parole or probation. No one may apply for a pardon until they have completed all sentences imposed for the applicant’s most recent conviction including parole, probation, or conditional release. Similarly, an applicant must not have any outstanding pecuniary penalties totaling more than $1,000. There are varying levels of pardons. Full pardons are mentioned above. When people are convicted of certain crimes in the state of Florida, they lose the rights to own, possess, or use firearms. The Governor may grant a Pardon Without Firearm Authority. This means that the person being pardoned may regain all of their rights with the exception of their right to access firearms. The Clemency Board may also qualify the pardon with various conditions. When these conditions are not satisfied, the Board retains the right to revoke the pardon. Commutations are not the same as pardons. When the Governor commutes a sentence, they make the sentence less severe. This does not restore any civil rights. Remissions of Fines and Forfeitures is comparable in that the Clemency Board may suspend, revoke, or decrease the monetary penalty assessed for crimes. The Clemency Board may grant or deny a pardon at any time for any reason. There is no appeal process. It is important to keep in mind that a pardon does not erase any convictions. This is not as trivial as it may first appear. When you are in a situation where you must disclose whether you have a felony conviction, such as a job interview, you still legally have that on your record. 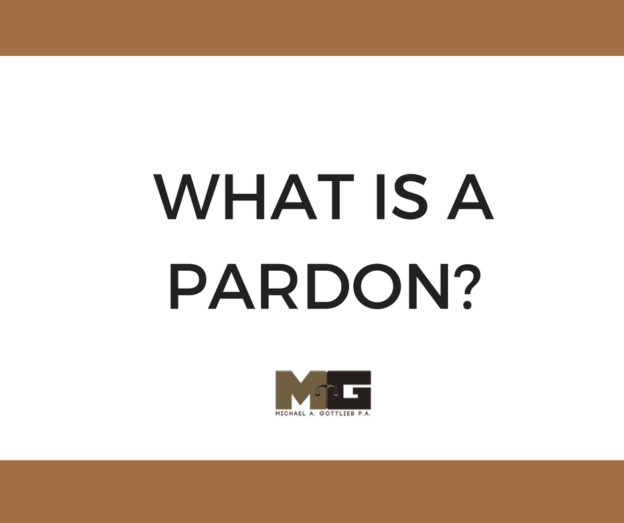 In addition, there is some legal debate as to whether accepting a pardon is a formal admission of guilt. This may open the door for civil suits. Expungements and pardons are two separate legal actions. When a crime is expunged, it no longer exists, legally. It is as if the crime never happened. This means that your record is completely clear. Curiously, expungements are easier to obtain than pardons. When you need a criminal record expungement attorney, Michael Gottlieb can help. Contact us at (954) 462-1005 today.